From Tombstone, Arizona, we continued south on Highway 80 to the town of Bisbee. I’d heard a lot of fun things about this former mining community and was really looking forward to exploring this quirky little town. Al and I anticipated Bisbee being similar to the town of Jerome, which we loved thus we were excited to experience Bisbee. The previous four days my energy had been low and I had a scratchy throat. I just wasn’t feeling like myself. As opposed to my usual go go go enthusiasm, I found myself having to push just to get out the door for any explorations. So as I share my thoughts on Bisbee, bear in mind my state of health. During its heyday, Bisbee was a bustling mining community centered around the Queen Anne mine. Today Bisbee is a tourist destination complete with art galleries, gift shops, museums, and mining memorabilia. Once the Queen Anne Mine ceased mining activity it was quickly turned into a tourist experience. Each mine tour is guided by a former miner. We thought we’d take one of these interesting mine tours after lunch. First we explore the town and shops. I love the old buildings and architecture. The town is also known for its abundance of stairs and even conducts a race every year. Many of the shops were closed the day we visited and the ones that were open were vastly overpriced. $95 for a cotton blouse seems a tad much to me. Moving on, we couldn’t wait to have lunch at Santiagos and boy it did not disappoint. The food was great. 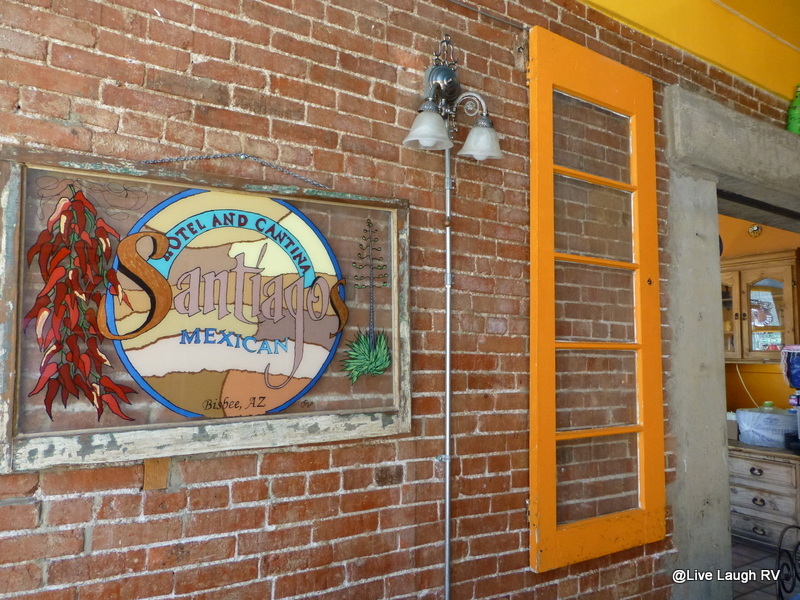 I would consider going back to Bisbee just to eat at Santiagos. After lunch we strolled around town a little more. I wasn’t feeling up to touring the mining museum or doing the Queen Anne Mine tour. We decided to hop in the truck and drive around…..I just wasn’t “getting it” and I was trying really hard to like this quirky Arizona town. What was I missing? Driving Bisbee’s side streets in a F250 with extended bed proved to be a bit of a challenge and probably not the smartest decision we made that day. At one extremely narrow point there was concern we’d be stuck between two buildings. Thank goodness we’re not a dually because we definitely would not have fit. I felt like we were driving through a small village in Europe…..tight squeeze. The architecture was enjoyable. Al and I were disappointed with Bisbee. Was it because I wasn’t feeling well? Was it because we didn’t tour the mine or museum? I don’t know, but just because we weren’t ‘feeling the vibe’ doesn’t mean you won’t. 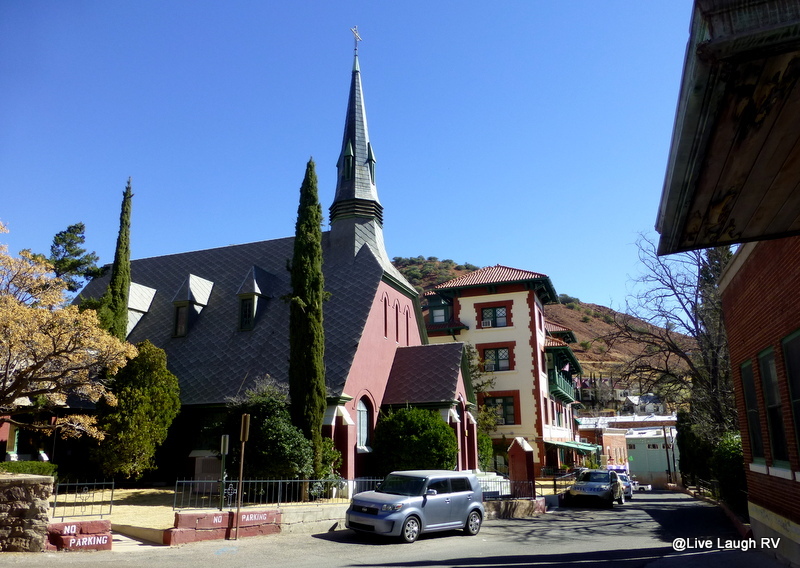 Check out Amanda‘s take on Bisbee. She and Tim had a great time in Bisbee. This has been on my list of places to visit while living out West. Thanks for sharing all these great photos! You welcome. I feel fortunate to be able to see some of these historic places. Beautiful sunset shot. Oh boy, you look tired in that photo, I hope you’re feeling better. I’m sure how you felt did affect how you perceived the place, hard to appreciate places when you’re feeling down. So happy that you’re catching up on blog posts. I know that means you’re feeling much better! We actually loved Bisbee when we visited several years ago, and are planning a return visit in our travels this spring. Like you, we avoid tourist traps, but hiking the stairs and hills of the town and seeing the wild street art is a lot of fun. We also loved the hike up to the shrine above the town. 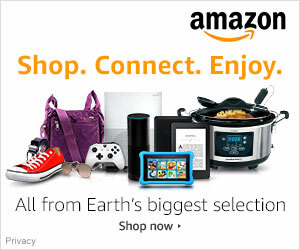 I think you will enjoy it on a return trip when you’re up to exploring. Since we will most likely be traveling the I-10 route regularly, I believe we’ll give Bisbee another go. 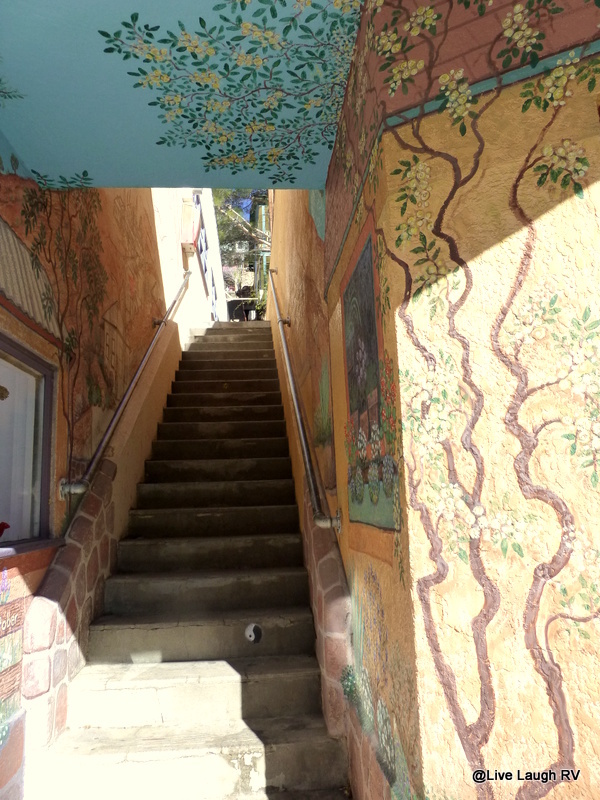 I’d like to hike the stairways around town and check out more of the street art and possibly do the mine tour. I’m sure I’ll view Bisbee differently when in better health. Where do you plan to be this summer? After much dithering, it looks like we’re heading back to the West coast for the summer — April in Texas, May in Arizona, June heading up 395 to Ashland (our home), and July and August in the San Juan Islands. How about you? Would love to meet up with you somewhere! Sounds like we’ve been on similar roads LOL. We loved Jerome when we were there in October and of course October is the best month to visit this haunted little town. I agree that Bisbee at night for the ghost tour is great. If you really want an experience there are haunted hotels in Bisbee that supposedly people have really seen ghosts. I’m unconvinced. I hope you’re soon completely well again, Ingrid. Those steps look quite challenging, but at least you had a go. 🙂 What a spectacular sunset! Read some posts from others that made me want to try those stairs and such great quirky fun art to capture with the camera. Hopeful your lungs are on the mend…you’d ace that race when you are back to speed. The mine sounds interesting…. Yep, I think we’ll return and give Bisbee another shot. I’d like to do a bunch of those staircases and tour the mine. I forgot to write about our tour of the Queen Mine Hotel that displays some wonderful antique’s; Singer sewing machine, typewriter, etc. Fun stop. Read Amanda’s post for more ideas. The AZ sunsets are the best and yes I’m on the mends but slower than I’d like. Still no hiking 😦 I’m sure I was just having a bad day when we visited Bisbee. That said, we might give it another try since our plans are to visit TX again. I am interested to see what I would think of Bisbee after all these years. I realize you are behind in your blog posts. But I do hope you just decided to sit and chill for awhile until you felt better. One of the best parts of this lifestyle is the ability to slow down or stop for awhile or for as long as you want. At least then you can enjoy what you are seeing. Yep, almost every night we’ve been enjoying gorgeous sunsets. Perfect place for me to focus on recovering. I went half way up that stairway and said enough! I could have been healthy taken one look at those stairs and said enough.. I only made it half way up. They actually conduct a race every year running all the stairways. Amanda wrote about it. I’d like to go back and do that race route….that is, provided I feel 100%. Can you say glute workout? I love it! May need to investigate that race! I totally agree about “something is missing” in Bisbee. Being an old “Hippy”, I felt like I had stepped back in time, but that crazy stuff didn’t feel right in the “Old West”. So many of the little towns are just tourism traps anymore…Give my the dust of an old abandoned ghost town and now you have my full attention..Hope you are feeling better by now..
Steve thinks the Ceviche at Santiagos is one of the best he’s ever had. We wished we were there with you enjoying it. Our short visit at Bisbee (with snow) was tempered with our broken window and were not able to explore more like you did. I never saw that staircase. 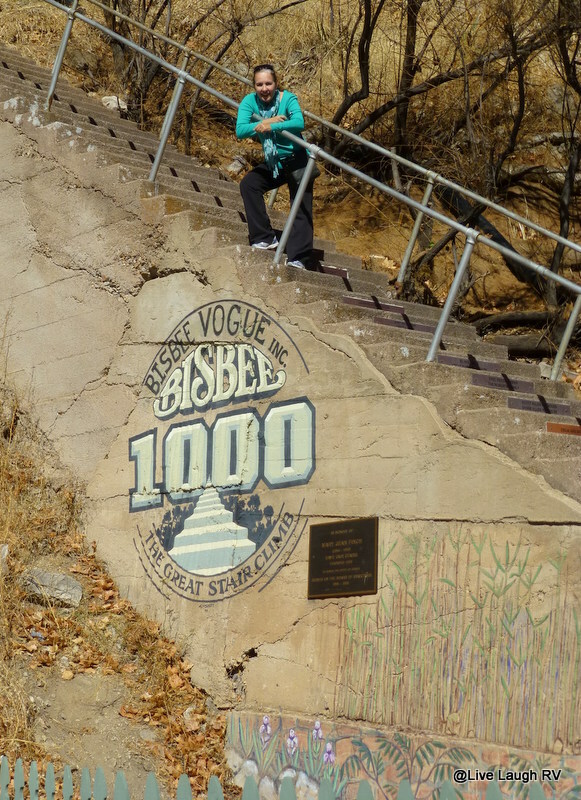 Maybe all those stairs were your undoing but I wasn’t thrilled with Bisbee either. It was good to see that it had reinvented itself after the mine closures but I thought it looked a little tired. Like you that day? You did such a nice write up on Bisbee and I wanted to share someone else’s experience besides my somewhat negative one. We may go back next season and give it another try when I’m feeling 100%. I’d also like to explore more of those staircases, maybe even do that race route that you guys did. My guess is that your illness put a damper on the experience. I think you were a good sport to climb any of those stairs and i will certainly hope you didn’t try all 1000 while under the weather. Beautiful sunset photo. I went about half way up those steps and said, “ok, far enough”. I was satisfied with that. It’s hard to get excited about exploring while feeling under the weather. 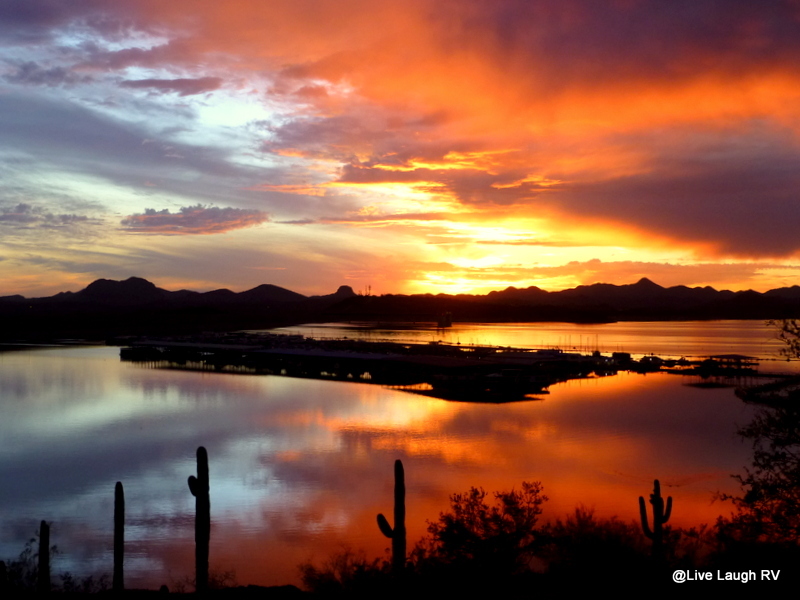 Love these AZ sunsets! What an amazing sunset photo, a calendar shot if I ever saw one! 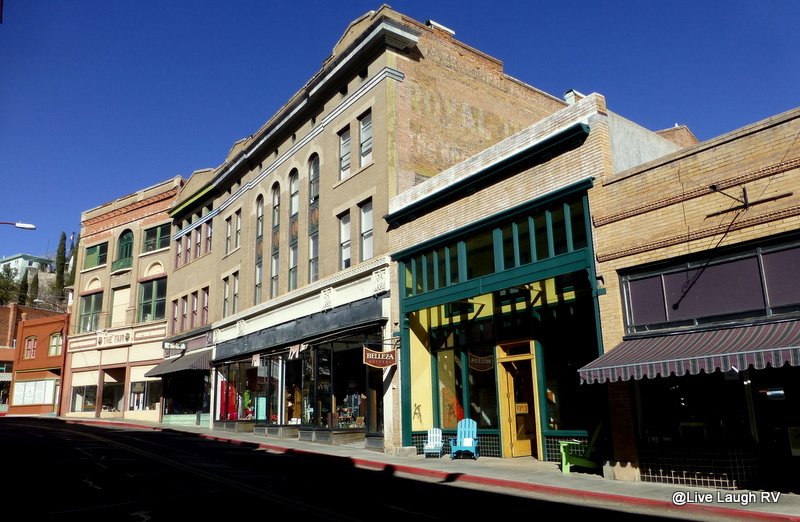 Bisbee needs to be explored in the nooks and crannies and on foot. I would have felt the same had I been in your shoes. Thanks for this tour back down the narrow hilly streets of my memory… I visited there in 1984, looks like little has changed. Being a ‘rockhound’, I spent time in a couple of related shops. In one I learned all about “dumpers”, persons going out onto the huge Phelps-Dodge mine dumps looking for turquoise, azurite, chrysocolla and the other copper related gemstones. These midnight miners would jump the fence (timed to avoid security patrols), and cover themselves with tarps to hide the lantern light as they dug down into the rock piles looking for specimens. I did take the Queen Mine Tour… I don’t like caves and mines in general, all the dripping and sounds of falling rock. My companion got very ill down in there, but likely because despite advice to the contrary she had had a glass of water with lunch the day before… across the border in Nogales. Bisbee is a very funky place! Wow, that seems a little crazy to be digging up rocks by lantern, but to each his own I guess. I’m glad I didn’t tour the mine that day or I may have had a similar experience as your companion did. However, I might consider going back and taking that tour and giving Bisbee another try when I’m feeling healthy. Sometimes you feel like a nut, sometimes you don’t. Sorry you’re ailing. I hope you are feeling better. I was feeling restless the day we were there also and we didn’t do as much. I think it’s just being in a “tourist” area that drains some of the energy out of you. 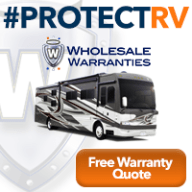 Maybe that’s why we full-timers start to enjoy the boondocking and solitude of those remote places, they seem more genuine. Maybe it’s just getting older and everything seems to be “been there done that” now. Since I’ve never been there, I can’t comment as to whether you just had a bad day there or not, but I do know from my travels that first impressions aren’t always correct. I know, sometimes ya just gotta give a place more time. We may return next season when I’m feeling 100%. We really enjoyed our time in Bisbee, perhaps your impressions were colored by your state of mind. (or body!) Its hard to get into a place when you have to push yourself, it’s no fun to do things you think you should, but don’t really feel like. Its probably good you didn’t do the Queen Mine tour. We did and it was quite a claustrophobic experience! Well, hope you’re feeling better. Yep, that’s what I was thinking because so many other folks love Bisbee. We’ll have an opportunity to revisit next season, and each day I start to feel better – thanks! All of those stairs would have let the air out of my balloon if I hadn’t been feeling well. Having had your bug, I know how bad you felt. I tried to do a similar thing when I got sick on the way to Niagara Falls on my honeymoon. It took every ounce of energy I had to not spoil the trip. By the time I felt better as we went down the Erie Canal, Rick started feeling like crap and was trying to push himself. One day, we’d like to go back and do it again healthy. As for Bisbee, I find it interesting that mining occurred until 1970s. It’s like a modern mining operation with the old west feel. It does seem too tourist trappy for my taste. I prefer places like Bodi, a ghost town along the Nevada/California border. Simply remnants of a once thriving city. No stores trying to sell the latest trinket…just the town…as if one day they all just up and left. I’m with you, I like old ghost towns. We hope to explore several this summer in Colorado. I was just beginning to feel that flu bug coming on. It didn’t hit me hard till a couple of days later. Brutal indeed. Oh, how exciting. Drink the wine and not the water LOL. You must have just hit that area on a bad day. We loved Bisbee so much more that Tomb$tone. Wish you could have had a bite to eat at the Bisbee Breakfast Club. It is the hot spot for community talk. We enjoyed a great tour of the Copper Queen Hotel. Hope you feel better very soon so you can enjoy the good life at 100%. Thanks….each day I start to feel more like myself. We might go back and give it another try and do the mine tour. We did tour the Copper Queen Hotel and loved all the antique memorabilia. The steps look like a workout – sorry you left Bisbee disappointed – keep moving forward – one step at a time and hope you are back to 100% soon. Perhaps I have reason to return. And thanks, I am finally starting to feel better although slower than I’d like. I’d like to try those steps (and probably regret it later) but oh that sunset!!! !